You are a loan officer. Do you need a website? An Internet presence can be a necessity or a resource-draining boondoggle, depending on your target audience. You shouldn't build or maintain a website simply because "everyone else has one." However, even if you own a one-person services company and get all the business you can handle through word of mouth, you can still create an online presence with a minimum of time and expense. If and when you do develop a business website, you'll need to make some kind of investment in Internet-based marketing. Consumers increasingly and overwhelmingly use the Internet to research and buy goods and services. This means the competition is robust, and if your site doesn't announce its presence it will simply sit and gather (virtual) dust in some computer's memory. If you've convinced yourself that you need to enter the web marketing arena, the following report provides a fundamental primer on the most widely used tactics for both paid and free Internet advertising. Just remember that each of the topics introduced here is complex enough that there are entire books written about them, so if something appeals to you do some additional research before jumping in. There are two main questions you must ask yourself before starting any marketing efforts, whether on- or offline: "Who is my audience?" and "What are my objectives?" The audience for most business marketing activities is obviously past, present, and future clients. However, as in traditional advertising and marketing, it helps to narrow down who you are trying to reach, segmenting your market by age, geography, gender, interests, occupation. Certain methods of Internet marketing, such as pay-per-click ads, allow you to target your clients based on this type of segmentation. Support and increase visibility of your company's brand. After defining your audience and marketing goals, you can begin to formulate an Internet marketing strategy and tactics. When getting into online marketing, it is important that you maintain brand consistency. Build on the reputation that you have already established. Your on-line presence should mirror that of your "brick and mortar" presence. Use the same logo and tagline so that people will understand that you are the same company. Having an online presence is a way to build on what you have already accomplished. We won't get into the vast topic of how to build and manage a website, but if you aim to use the techniques described below, it is nearly essential to have one. Most of your marketing efforts will have a "call to action" that involves your audience visiting your website to research products or services, find contact information, sign up for a newsletter, or place an online order. Whatever you are asking people to do in your online promotions, make sure the website allows them to easily complete that task. One other vital component of any business website is an analytics program (Google offers a fairly robust application free of charge), so you can track how well your marketing efforts are working and calculate the return on your advertising investment (ROI). How can you develop an online presence at little or no cost? There are several companies that offer free site building tools and hosting services. If you go this route, select a company that has a proven track record, so your hard work isn't wasted when the company goes out of business or suspends the service. E-mail newsletters provide one of the most highly performing avenues for marketing. You can collect client e-mail addresses by asking visitors that come to your website to subscribe, by requesting e-mail addresses from anyone who visits your physical location, or by purchasing an e-mail list. To generate a higher rate of readership, make sure the audience is narrowly targeted and has some vested interest in your service. By sending out your newsletter on a regular schedule (weekly, monthly, quarterly, etc.) you can counteract the transient and temporary nature of Internet users by continually reminding them of your company's existence. Affordable services like Constant Contact can be used to manage mailing lists, statistics, and opt-in/out functions. You will need to maintain one or more separate lists for the purpose of sending targeted messages to particular audiences (see Other Announcements below). You might combine all your lists to send a monthly newsletter, and send other bulletins to past or potential clients as appropriate. Other announcements are e-mailings that can consist of press releases, special notices, or anything you want to communicate specifically to members of one or more e-mail lists. Search engine optimization means constructing a website that is easily crawled by search engine spiders, and it encompasses a variety of techniques designed to improve your site's (or page's) ranking in the search engine results page. The goal is for your site to be found by searchers who are looking for sites related to a certain keyword or phrase, for example "little red wagon" if you are in the business of selling toy wagons. SEO can be divided into on-page activities (e.g., amount of content, metadata, links, programming methods and structural issues) and off-page activities (most importantly, obtaining links from other websites to your site). Pay-per-click advertising refers to text ads displayed on search engine results pages (versus "organic" results achieved by SEO) and other sites, usually in the margins. In the case of Google AdWords and Microsoft's adCenter, you can open an account and specify the keyword(s) that, when searched for, will generate an ad that links to your website. You pay only when a searcher clicks an ad and is directed to your site. In the example below, the key phrase is "little red wagon," and pay-per-click ads are located at top (in yellow) and in the right-hand column (subtitled "Sponsored Links"). The first organic listing is "Little Red Wagon Foundation." 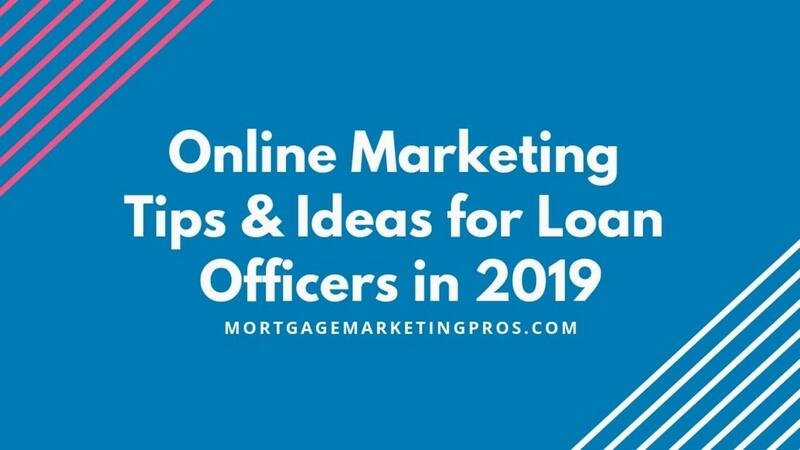 Keep in mind that PPC campaigns are very expensive for mortgage and real estate, so unless you have a big budget for it and a professional company that can setup and maintain your campaigns for you with a proven track record, then I would not suggest that you do it just yet. Social networking is the latest buzz in the modern marketing arsenal. If you have any doubt about its impact, especially on the under-40 population, read this list. Loan Officers with limited resources should weigh their time spent and the potential benefits carefully, however. It can also be difficult to measure the return on your investment for some of these tactics. The general principle of "marketing" on social networking outlets is that people who have similar interests will virtually congregate around Web content that discusses that interest. They may be interested in product information in the form of reviews or personal opinion, but hard sale approaches are mostly discouraged and unproductive. Your goal is to become a trusted advisor-which usually means revealing your identity and at least some part of your personality. If that premise makes you uncomfortable, you might still find social networking sites valuable for market research purposes. Find out what people are buying and why, then use that information to help shape your other marketing activities. YouTube allows you to post videos on your own "channel," a distinct Web page that can be customized and allows for posting links back to your own website. A major positive aspect of this venue is that the number of views is posted and viewers can submit comments, so you know whether your videos are popular and why. Facebook is considered the model for modern social networking sites. Facebook allows you (individual, corporate, non-profit, etc.) to create a page, attract "likes" and reviews, communicate with followers by posting status updates, photos and videos, and so on. Think of Twitter as a mini-blog (see below) that allows you to broadcast messages of 140 characters or less. The messages appear to your "followers" on their phones or computers, as well as on Twitter.com. The biggest challenges are to gain a useful number of followers and to think of something engaging to write to them. If you are a speaker, writer, or performer Twitter can be used to let your fans know what you're doing and when. If you have a retail store you might let your followers know that you're offering a discounted item or running a special sale. You should post a Twitter sign-up link on your website, and within your signature line in outgoing e-mail messages. You can also gain followers by following people who work in or comment on your industry, as some Twitter users will follow those who follow them. The word blog originally came from the term "Web log." There's no real standard for what a blog is, but most commonly authors use them to comment on (and link to) other online news items, websites, or other Internet content. For the most part, direct selling on a blog is frowned upon and is probably a recipe for driving away potential readers. What do you write about, then? Well, if you run an Internet marketing firm you write about trends in Web marketing, what the search engines are up to, tips for do-it-yourselfers, or what you thought of the latest Hollywood blockbuster. Seriously, read some blogs and you will find all sorts of personal opinion mixed in with professional advice and commentary. The goal of your blog, however, should most likely be to establish yourself as an expert and trusted advisor in your chosen field. Ask colleagues to be "guest bloggers" by writing articles for you to post, again giving them credit and adding their byline and a link to their website. Using links is a good way to drive additional traffic to their sites so it's a good trade-off for both parties. You can easily build your own bulletin board/forum component on your site with free or low-cost software. User forums have the potential to greatly increase the "stickiness" of a site, given a critical mass of traffic required to generate new discussions and keep participants interested in returning. You can start by "seeding" topics on your own, but there won't be any results until traffic is directed to the forums. The conundrum for Loan Officers may be the time required to moderate a forum once it becomes successful. One solution is to seek out a volunteer moderator who exhibits a keen interest in your field. A sample of a baseball trading card forum is shown in the screen shot below. Online directories allow Internet users to browse through categories of topics to find websites related to a certain subject. There are directories for businesses, blogs, websites in general, and more. Many directories are free, and some only list you if you pay. Be aware that you might wait a long time for some of the free directories to list your site, as they may rely on volunteer screeners. Directories not only allow consumers to find you in their listings, they also help get your site indexed in the major search engines. If you submit your site to a directory, make sure to read the submission guidelines and follow them exactly.